One of the most enigmatic stellar systems in our Milky Way Galaxy has been shown to harbour a very massive black hole. With 14 times more mass than the Sun , this is the heaviest known stellar black hole in the Galaxy. Using the ISAAC instrument on the Very Large Telescope (VLT) 8.2-metre ANTU telescope at the ESO Paranal Observatory, an international team of astronomers  peered into a remote area of the Milky Way to probe the binary system GRS 1915+105, located almost 40,000 light-years away. They were able to identify the low-mass star that feeds the black hole by means of a steady flow of stellar material. A detailed follow-up study revealed how this star revolves around its hungry companion. The analysis of the orbital motion then made it possible to estimate the mass of the black hole. The observation of the heavy black hole in GRS 1915+105 is opening up fundamental questions about how massive stellar black holes form, and whether or not such objects rotate around their own axes. A few objects within our own Galaxy look very much like miniature versions of the very energetic quasars, observed at the centres of remote galaxies. Quasars are believed to harbour supermassive black holes at their centres, and they emit copious amounts of energy as the surrounding matter accretes into a disk and spirals into the hole. Occasionally, quasars spout jets of gas at velocities very close to the speed of light. Microquasars are basically the same thing, but at scales a million times smaller. They are binary stellar systems in our Galaxy in which a more or less normal star orbits a compact object, which may be a neutron star or a black hole. Those microquasars also show energetic outflows and signs of accretion of matter onto the compact object. Not unexpectedly, it appears that the most enigmatic of these systems are the ones that contain a black hole. The discovery of objects that are relatively nearby in cosmological terms and which mimic the properties of the remote quasars has opened up interesting new perspectives and promises to help us to better understand the strange phenomena that are associated with jets and accretion disks around black holes. The binary stellar system GRS 1915+105 is one of a handful of microquasars known in our Galaxy. This system was first discovered in 1994 by the GRANAT X-ray satellite. In X-ray radiation, GRS 1915+105 shows bright and sporadic outbursts. 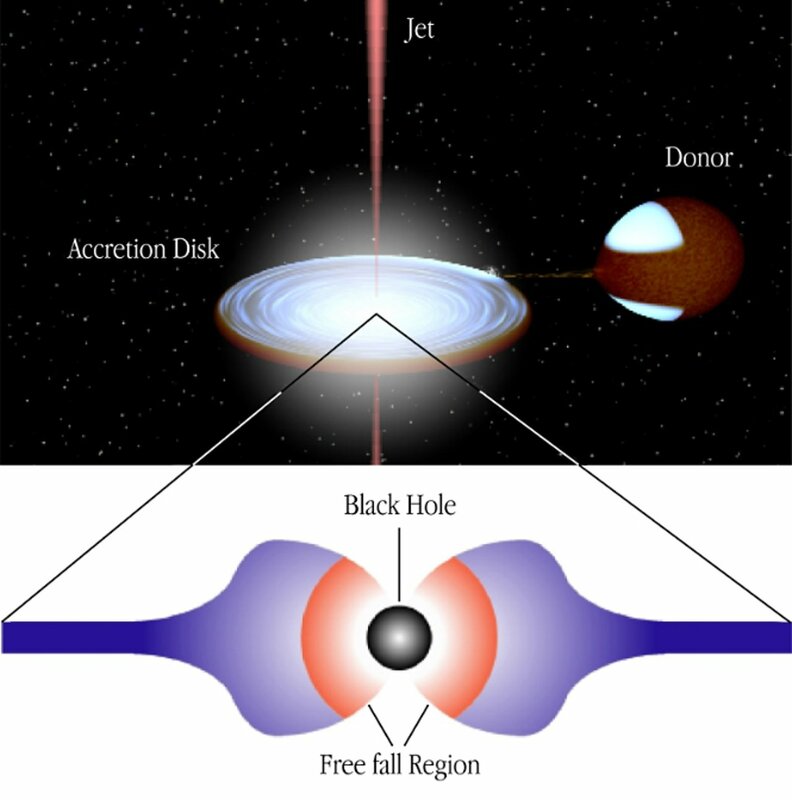 The variable X-ray radiation has been interpreted as due to infall of matter onto the black hole from the inner region of a surrounding accretion disk. This enigmatic source was also observed to eject clouds of hot gas at velocities very close to the speed of light. GRS 1915+105 is thus a prototype microquasar and has become a main target for the study of accretion onto a black hole of stellar mass. GRS 1915+105 lies in the constellation Aquila (The Eagle) and is located near the main plane of the Milky Way Galaxy, some 40 000 light-years away from the Sun. A lot of gas and dust in that plane hides it from our view in the visible light. This obscuration has severely impeded any detailed investigation of the system, and it still remained to be proven whether or not it really contains a massive black hole. The team of astronomers  therefore decided to perform infrared observations of GRS 1915+105, in a spectral region where the obscuration of dust is much less severe than in visible light. It is still not a trivial observation since even in the infrared only a few percent of the light emitted by GRS 1915+105 reaches Earth after the long journey through the intervening clouds. 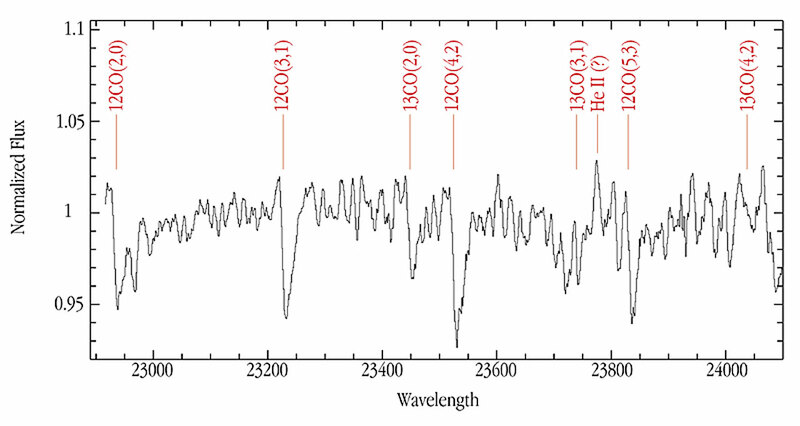 A large telescope is needed to register detailed spectra of GRS 1915+105 . The first set of observations was obtained with the multi-mode ISAAC instrument on the VLT 8.2-m ANTU telescope, already in the summer of 1999. The spectra were of very high quality and contained several spectral lines (ESO Press Photo eso0135). In particular, a number of previously unnoticed spectral features from carbon monoxide molecules were securely identified. These lines are formed in the atmosphere of the star which revolves around the black hole and feeds it with matter (it is therefore known as the "donor star"). A high-quality infrared spectrum was needed to detect and measure these lines because only a small fraction of the light received actually comes from the binary star. Most of the light that is registered by the instrument comes from the surrounding accretion disk or from ejected matter in the neighbourhood, and therefore tends to hide the spectral lines of the donor star. After a careful analysis of the observed spectral lines, the astronomers were able to infer that the star donating matter to the compact object is a low-mass star, with about the same mass as our Sun. But this was only the beginning of this long-term observational programme. 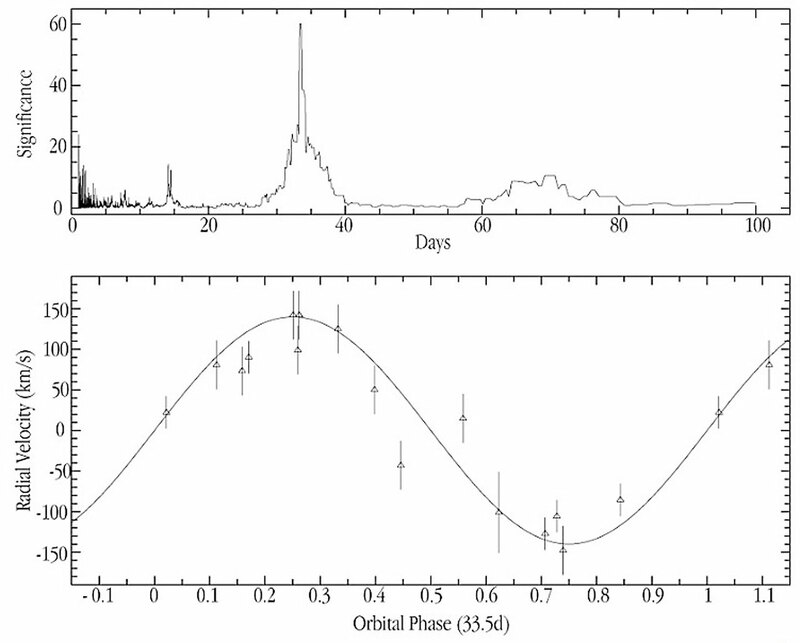 The identification of the distinct carbon monoxide bands in the spectrum of the donor star then allowed the astronomers to search for the orbital motion of the system. As the binary star orbits its compact and dark companion, the Doppler motion will induce small shifts in the positions of the spectral lines. Monitoring these shifts reveals how fast the star moves and therefore determines the size and shape of its orbit around the black hole. This in turn makes it possible to determine the mass of the invisible object that is needed to keep the star moving in that orbit. The observational campaign started in April 2000 and continued until September 2000 with observations taken on 16 different nights. The velocity variations revealed by the line shifts were searched for periodicity and the best fit was found for a period of 33.5 days. This is interpreted as the time it takes for the donor star to orbit the compact object. The radial velocity curve for this period is shown in ESO Press Photo eso0135. From the orbital motion, it is then easy to deduce a lower limit on the mass of the compact object. In this way, it was shown that the invisible companion in GRS 1915+105 must in any case be heavier than 9.5 solar masses. A compact, unseen companion can either be a neutron star or a black hole. It is quite difficult to distinguish between these two invisible candidates. However, it is known that a neutron star cannot possibly be heavier than about 3 solar masses. If a neutron star were heavier than that, it would no longer be able to support its own weight and would quickly collapse into a black hole. The lower limit on the mass determined for GRS 1915+105 is definitely higher than the maximum possible mass for a neutron star. The conclusion is clear: the compact object in GRS 1915+105 is indeed a black hole. However, the astronomers could do better than this - they were able to deduce not just a minimum, but also the actual mass of the black hole. First, knowing the nature of the donor star gives a good estimate of the mass of that star. Secondly, some constraints can be set on the inclination of the orbit from the known jet features. With this additional information, the astronomers finally concluded that the black hole must weigh as much as 14 solar masses . Until now, about a dozen black holes in the Galaxy have been confirmed by determining their masses in this way. GRS 1915+105 is the heaviest of the stellar black holes so far known in the Milky Way Galaxy. Knowing the mass of the black hole in GRS 1915+105 now poses challenges to several fields in astrophysics. First of all, it is not easy to understand how such a massive black hole can be formed in a binary stellar system. It is well known that the most massive stars lose significant fractions of their mass through violent stellar winds at the end of their lives. Interaction among the two stars in a binary system can further increase the mass loss by the massive star. It thus remains to be investigated how any star can retain enough mass to eventually end up forming a black hole as heavy as 14 solar masses. Another puzzling aspect regards the spin of the black hole. That some stellar black holes rotate has been suggested on several grounds. It is believed that when the black hole rotates in the same direction as does the accretion disk, the disk can extend much closer inwards towards the black hole. The result is a hotter disk. Two X-ray binaries are known to be very hot, GRS 1915+105 and Nova Scorpii, and it was therefore believed that these two contain black holes that must spin rapidly. A completely different line of evidence for black hole rotation comes from the quasi-periodic oscillations often seen in X-ray binaries. Those oscillations are generally interpreted as due to effects of the spinning black hole on the surrounding accretion disk, although the exact mechanism is a matter of debate. However, the new mass determination for the black hole in GRS 1915+105 indicates that the picture may not be as simple as that. In fact, if GRS 1915+105 and Nova Scorpii both have rapidly spinning black holes, none of the current theories for the quasi-periodic oscillations seem to work. And so, as is often the case in science, new information also brings new puzzles. : 1 solar mass = 2 x 10^30 kg. The mass of the black hole in the X-ray binary stellar system GRS 1915+105 described in this Press Release is therefore nearly 30,000,000,000,000,000,000,000,000,000,000 kg. : The team consists of Jochen Greiner, Mark McCaughrean (Astrophysical Institute Potsdam, Germany) and Jean-Gabriel Cuby (European Southern Observatory, Chile). The research described in this Press Release will appear in "GRS 1915+105 - An unusually massive stellar black hole in the Galaxy" by Jochen Greiner, Mark McCaughrean and Jean-Gabriel Cuby in the November 29, 2001, issue of the science journal "Nature". The first stage is described in "Identification of the donor in the X-ray binary GRS 1915+105" by Greiner and co-authors and is published in the July 2001 issue of the European research journal "Astronomy and Astrophysics".